This is reposted from another forum. Just heard about this. I understand some folks staying in a hotel on the beach saw a kiter go down, not get back up and eventually noted his kite move away. They called the authorities and a search ensued. He swam to shore on his own without his kite. 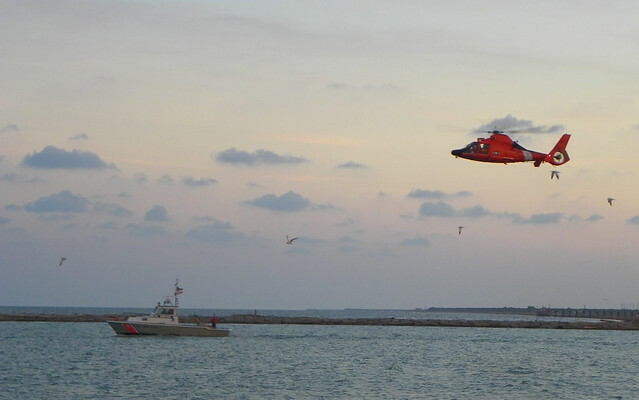 He was eventually located on shore after the search was launched and the USCG had recovered his kite. If you lose your kite or board, contact the authorities (USCG) to say it has been lost, where and when to avoid an unnecessary search. We sometimes read of a board or kite being found in various parts of the country and related searches. You might even get your gear back if you are lucky but more importantly these folks won't launch a search for someone who isn't lost. It is also a good idea to let someone at home know where you will be kiting with an update if you change spots. Having your contact number on your board makes sense too. It would be good to talk about the conditions that can cause you to lose a kite or a board. What are some things you have experienced? Preserve the rescue services for the time you might really need them by staying aware. Come to find out this guy went out in offshore wind conditions without a chase boat with a lot of land related turbulence. You can count on these sort of conditions substantially increasing the odds of problems, swimming in, lost gear, maybe even a lost kiter. Wow, I was asking for discussion of things that will cause you to lose your kite, I didn't realize conditions were offshore there. Dead offshore winds particularly with buildings, dunes, trees, etc. shoreside have a HIGH probability of resulting in a lost kite, board too and sometimes even a kiter to go with. These are BAD conditions to launch into. Don't be deceived by the nice calm water, apparent good wind conditions because it is a false impression. The wind is too gusty to support good kiting conditions. The wind drops to near nothing your kite stalls hits the water and pulls you offshore. Then it boosts and you get yarded before the next drop. You may get it up while continuing to drift offshore, you may relaunch, do a few tacks trying to work to shoreward until it lulls and stalls again. Repeat, repeat and repeat again with you going further offshore. I stupidly proved this to myself in offshore winds about ten years ago resulting in a 2 mile+ swim inland towing my gear behind me. Don't screw with offshore wind conditions in short. There are still other conditions that can cause you to lose kite, board or both particularly on the west coast and other areas with frequent cuts and bays. What are some of them? Ironically they just had a story on the Weather Channel's series "Lifeguard!" about a board drifting from the discharge of a 200 yard rip current off Huntington Beach, CA. They had a helicopter that had sighted the board with no kiter. This commits them to doing a search until the kiter is found one way or the other. They eventually noticed a kiter standing on the beach looking around without a board and made the connection. Letting the lifeguards know you lost your board can help at times. The west coast can have some very powerful, long rips due to long period deepwater waves coming in. People can still get separated from their board in southeast Florida rips. Some of our most powerful rips come from inlets and we have no shortage of those. The outwash from cuts and inlets can extend well offshore. If you separate from your board on an outgoing or incoming tide for that matter, you may well lose it. The suggestion for your name and number on your gear can pay dividends in improving the odds of your getting it back and to reduce the chance of an unnecessary search effort. You can readily see rip currents from shore if you look for them. They can be less obvious once you are in the water, less so from your board however. 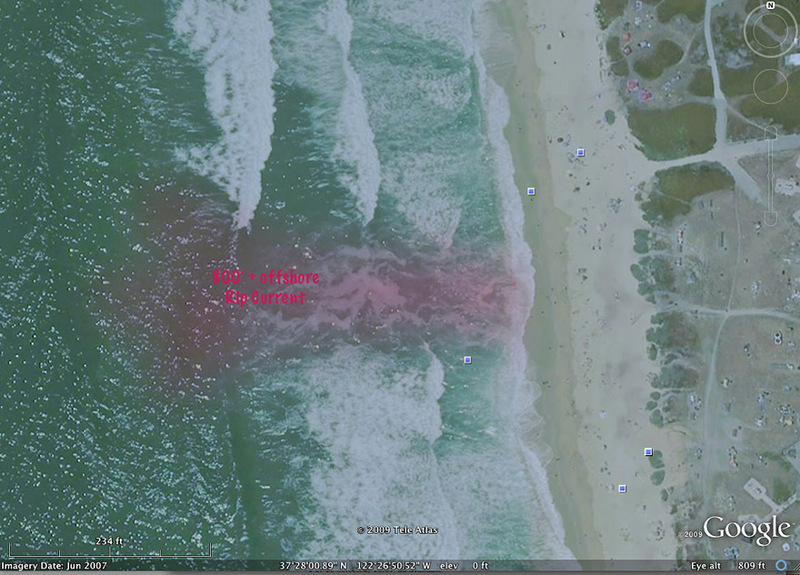 A powerful 800 ft.+ rip current in California. So, what are some board losing scenarios? 1. Being overpowered or underpowered to where body dragging upwind is difficult to infeasible. 2. Strong side shore or worse side offshore winds can easily take the board away from you and out of sight. REMEMBER, just because you start with nice side onshore or even side shore winds, it doesn't mean it will stay that way. Fronts clock winds through 90 degree direction shifts or so regularly. Also the wind speed can drop below kiting speed or boost way up further complicating staying with your board. ALSO, thermal winds can kick in nice side to side onshore winds but once the gradient wains later in the day or sunset, the wind can suddenly shut off or shift dead offshore in seconds. These changes can happen rapidly at times. Pay attention to forecasts, conditions, time of the day, etc. and don't get caught unaware. Learn to expect change and act in advance of it. 3. Foot straps pop out and conditions obstruct your ability to body drag to it. Major wipeouts can put a large separation distance between you and your board too, perhaps too great a distance for recovery. 4. Adverse currents. This covers a lot of different situations. If you are near a gap in a bar, inlet or cut it is possible for the current to be running straight into the wind. Body dragging to recover your board can be infeasible. If you are kiting off an island and there is a current sweeping past and away from the island, this is a real bad place to lose your board. Wiping out around the break and having the board flushed offshore by a rip current. Currents like wind can change during a session with tide or other reasons. Something like this may have happened in the Wx Channel case. It is important to realize you are in a rip if you are trying to get back into shore. You can swim to exhaustion fighting a rip when swimming parallel to it and then heading in can see you on shore faster and easier. There are still other ways you can lose a board, what are they? We can lose kites too, what are some of the ways this can happen? For most kiting scenarios, board leashes are a real bad idea. No amount of helmets or impact vests effectively improve the situation. Kiters have had their teeth bashed out, throats cut, helmet sliced clean through by rebounding boards on leashes. This includes both static and reel leashes. Body dragging or a Joe Pro is the way to go. Despite this, you should accept that it is possible you might lose a board someday. That would be a lot less costly and painful than dealing with a bad leash propelled board impact. A number of kiters have been killed through board leash use by the way. Working to be a strong waterman, wearing an impact vest, kiting with others make good sense. Work to spot and anticipate problems and avoid them in advance.